When filling the photo Advent calendar, you decide the treats! With this Advent photo calendar, you can give more than chocolate treats, because you decide the filling! Personally chosen gifts provide the greatest pleasure. Why wait until Christmas? With the Advent calendar for self-filling, you will be celebrating a bit of fun every day during the pre-Christmas season: behind the little doors you hide 24 surprises that fit the recipient perfectly. 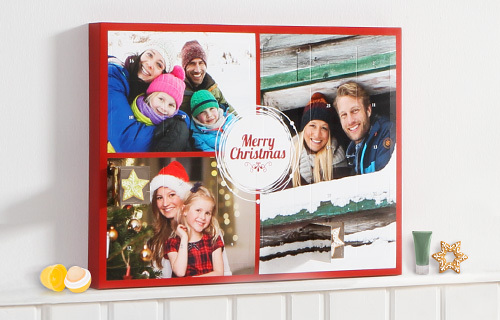 Whether for your children, partner, grandparents or friends and colleagues: Create a truly unique Advent photo calendar in size 48×36×3.5 cm, to surprise your loved one; and not only with chocolate, because: you decide for yourself how you fill the Advent calendar. The inside blister, which you can pull out through a side opening, fits 24 little surprises. For example: small creams and perfumes, tea, coffee capsules, herbs, jewellery, hobby accessories, toys and collectibles. Short messages, riddles or craft items will fit, too. You can also be creative in the design of the self-filling Advent calendar: Choose your picture and decorate it with our optional winter and Christmas templates! We print the images professionally onto the silk-matte-finish front of the calendar. A decorative eye-catcher with Christmas flair. The lovingly selected surprises shorten, door for door, the wait for Christmas.